This Pregnancy course offers a safe approach to gentle and thoughtful flow with poses and breath work. Have a peaceful moment to connect with your baby and embrace this new phase of your life. Breathing practices that can support the many changes taking place both physically and emotionally. 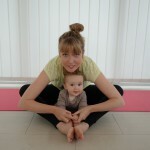 Yoga stretches create space within the body for the growing baby helping the mother feel more comfortable. Deep relaxation at the end of class to nourish you as a mother and your baby so you can leave feeling positive, empowered, relaxed and informed about your pregnancy and birth. When can I start? You can join our pregnancy classes from 14 weeks pregnant and you can continue right up until birth of your baby. Classes can be started when the baby is about six weeks, if there are no complications, up until crawling. If you have had a Caesarean, please seek your doctor’s advice before attending. All yoga props are provided. Classes limited to 8 mums so please book early. This studio is not big, buggies and prams can be left outside on patio and if rain we can leave them in a treatment room. Please note Consult your GP for advice on when to resume practising. It is important to rest initially. The first 6 weeks after birth are a time for bonding with the baby and for the mother to recover. By the end of the first eight weeks of the postnatal period, women should be ready to return to their regular practice, but it is important to listen to what the body is ready to do.